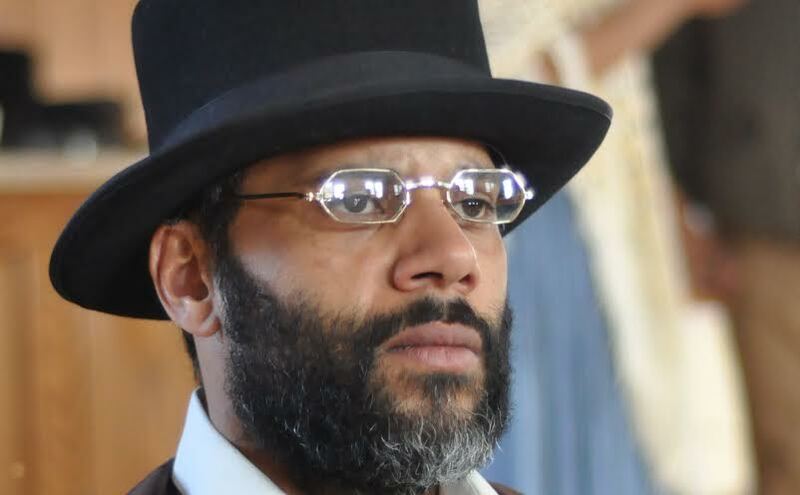 Chris Clare as Elijah McCoy. Photo by Nancy DesLauriers. In the almost three years I’ve been reviewing theatre in Calgary, I can count on one hand the amount of black actors I’ve seen on the stage in this city. The truth is that while Calgary’s offering of new and unique work grows stronger each year, the amount of diversity on the stage remains wanting. Therefore, it was with great delight that I digested the news that a new theatre company, Ellipsis Tree Collective, was about to change all that by producing the inaugural Black Canadian Theatre Series featuring stories by Afri-Canadian playwrights about Black Canadian life over the last 150 years. However, good intentions don’t necessarily result in good plays, and unfortunately the first show out of the gate from this fledgling company misses the mark on a number of fronts. Set in the late 1800’s, The Real McCoy, by Andrew Moodie tells the story Elijah McCoy, the Afri-Canadian engineer who invented (among other things) a lubricating device that revolutionized the way steam engine trains operate. Based loosely on the real life of McCoy (who is the source of the expression ‘the real McCoy’), the play under Edward Ogum’s direction, attempts to show how the colour of Elijah’s skin prevented him from ever getting the recognition or financial success he deserved. But while the play provides many instances for the audience to experience moral indignation, Moodie’s script with its flashcard historical story telling and very little interest in the character’s inner lives, makes the production a slog. It’s the downfall of many writers who try to cram too much of a life into one script – the quick succession short scenes certainly tell you what happened but don’t let the story breath enough for anyone to really care. Here Moodie takes us from McCoy’s boyhood days in Canada with his father and nanny where it’s quickly established that Elijah is something of a boy genius to his happy university days in Edinburgh to the racist reality of America where McCoy invents his device but is robbed of his ability to claim credit or profit. He experiences love twice, great heartbreak and loss and many white business associates continually take full advantage of his position, yet not once does Moodie allow us inside McCoy’s head to really understand how he felt. Instead Moodie has the adult McCoy narrate the action of his younger self and the young Elijah provide some inner voice narratives of his adult self. Having never been a fan of this script tool, here it felt even more problematic as both old and young Elijah simply move the story along without bringing any true insight or emotion to the narrative. Adding to our sense of disconnection from the story is Ogum’s direction which often has actors speaking away from the audience leaving us straining to follow the dialogue in spots. If projection issues weren’t enough to cause frustration, Ogum’s staging which in no way considers the level floor seating, ramps the vexation up many notches. Having much of your action take place on or close to the stage floor when this viewpoint is impossible for any audience member sitting beyond the first few rows, is a directorial mistake this already problematic play cannot afford. Despite all this, the cast does a noble job. Chris Clare as McCoy brings some weight to the role even if he is often hampered by the woodenness of the script and unfortunate direction. The rest of the cast takes turns in multiple roles with greater or lesser success. Among the more substantial performances are Chad Hackett as Elijah’s black co-worker, Janelle Cooper and Norma Lewis as Elijah’s wives, nanny and maid and Kevin Rothery who corners the small humour market in the play as McCoy’s Scottish professor. But even some decent performances can’t bring the drama back to this ultimately dull play. Truth be told, it was trying to find the theatre that provided the only real drama of the evening. Located within the boundaries of Heritage Park, the Canmore Opera house is difficult to find. The security guard tasked with opening the park gates and providing directions was missing and even once inside the park, there was no signage locating the theatre. Organizers tell me that better signage will be set up for future productions which audience members will be grateful for. However, no matter how much easier the theatre is located; the missed opportunity to tell an important story in an affecting way will remain onstage.